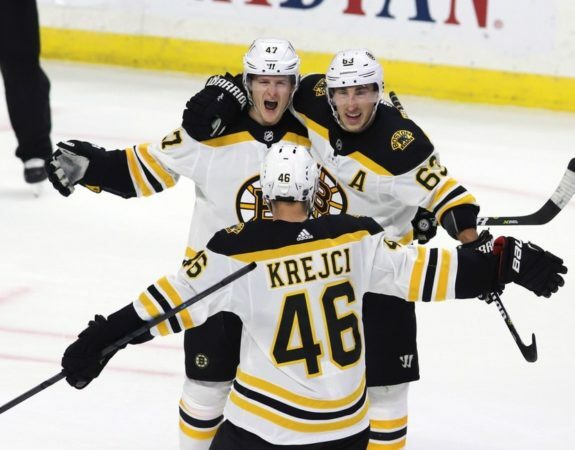 The Boston Bruins have been staying afloat in the Atlantic Division standings despite the numerous (and significant) injuries that have hampered them for the second consecutive season. Those injuries actually play a significant role in some of the questions that were asked for this mailbag. My gut feeling says Ryan Fitzgerald will be the next player from Providence called up to the main roster. I felt he was NHL ready prior to the season and he’s doing nothing to dispell those feelings in his second full season in Providence. After an impressive 21 goals and 37 points in 65 games in his rookie season with the team, the 24-year-old has scored seven goals and 21 points in 26 games this season. He’s scoring goals at a lower clip (0.27 goals-per-game compared to 0.32 goals-per-game a year ago) but he’s producing points at a significantly better rate with 0.80 points-per-game compared to only 0.57 last year. donatBoston Bruins center Ryan Fitzgerald and Chicago Blackhawks defenseman Cody Franson (Brian Fluharty-USA TODAY Sports)With the versatility to play at center and on the wing, Fitzgerald is capable of playing up and down the lineup. If the Bruins find themselves in need of another forward at some point this season, Fitzgerald seems like the only logical choice. I think Zach Senysyn has value and would fill a need for the Bruins. With that said, I think he’s best suited in Providence for the remainder of this season so he can continue to develop into a 200-foot power forward. If he can have a similar trajectory to that of Jake DeBrusk, I think everybody will be happy. I hate the idea of the Bruins bringing in an impact player strictly as a rental. If they decide to make a depth trade to address a position of need (something they likely won’t need to given the number of depth players they already have) at the cost of a low-end prospect or draft pick, that’s one thing. 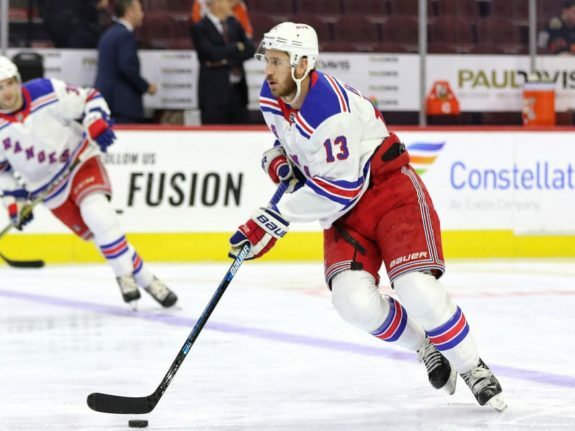 Making a trade involving a top prospect, draft pick or positional player just for one shot at a Championship just doesn’t feel like a good idea after the team went all-in with the Rick Nash deal a season ago. When looking at players like Gustav Nyquist and Mats Zuccarello, the cost to acquire players who probably don’t move the needle just doesn’t seem to be worth the while. Of the two, Nyquist is the more appealing option simply because he’s performing at nearly a point-per-game clip this season with 29 points in 32 games. While I don’t love the idea of the Bruins trading for a rental, there is one player on an expiring contract that I’ve mentioned in the past who still stands out as a logical fit for the Bruins. Kevin Hayes can play at center and on the wing and has No. 1 center potential. If the Bruins can acquire him and lock him up for the long-term at a reasonable trade price and cap hit, they’d be in very good shape for the present and the future. As a straight rental, I wouldn’t want the team to make the investment; it would have to come with an extension. That’s been the lineup I’ve been hoping for since the start of the season. It’s obvious that David Krejci and David Pastrnak have chemistry. Place them on a line with DeBrusk, a regular on Krejci’s line since last season, and there’s obviously potential for fireworks. While there may be some people calling for Krejci to center a line of Pastrnak and Brad Marchand even when Patrice Bergeron is healthy. In theory, it makes sense to keep them together given the fact that all three have looked rejuvenated when played together. At the same time, Bergeron and Marchand are the NHL’s best duo and performed well with Bjork last season. If the Bruins want to make a trade to address their final top-six winger spot, they should at least make sure they exhaust all of their options first. That includes using Bjork in a top-six role alongside Bergeron and Marchand. No panic button necessary. There’s only one source to that claim and its one that nobody has ever heard of. It’s easy to be concerned with something claiming that the Bruins’ best player will be out for the season, but he and Zdeno Chara were both on the ice for nearly a full hour prior to Bruins’ practice Thursday and are much closer to a return than being out for the season. 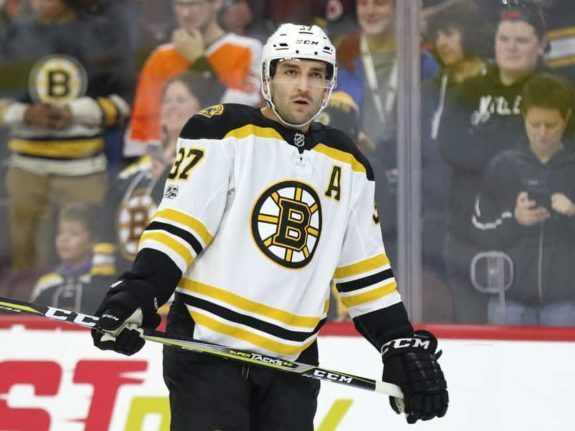 If Bergeron was out for the season, the team would need to make a major trade to address the center position; something they may do even when he does return. Fortunately, the team has been playing well as of late and may be better suited to wait out the center position, for now, to see how the lineup looks with No. 37 back on the team. It’s no secret that the Bruins have a bevy of young players and prospects who have to be considered valuable. While many have already made an appearance in the NHL in impact roles or otherwise, there are still quite a few who have yet to even make their AHL debut. 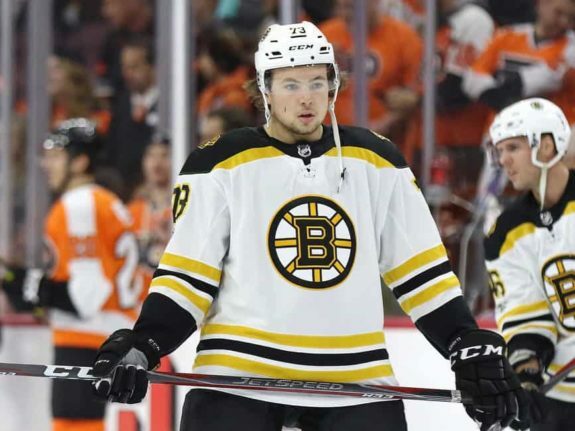 Assuming the only untouchable young players for the Bruins are Charlie McAvoy, Pastrnak and DeBrusk, that would leave over a dozen valuable players left available through trade. In my mind, Jack Studnicka and Urho Vaakanainen should also be considered untouchable. I’m also partial to Bjork and want to see what he’s capable of, so he’s someone I would trade if I was in charge. That said, all of those three players are going to be included in this order. To be clear: this list isn’t necessarily the order that I would necessarily value the Bruins’ prospect system in. For example, Senyshyn’s perceived value is far lower than his actual value. Similarly, I feel like Donato’s perceived value is potentially higher than it should be on this particular list (at this time, at least), especially because he’s rounding into form.